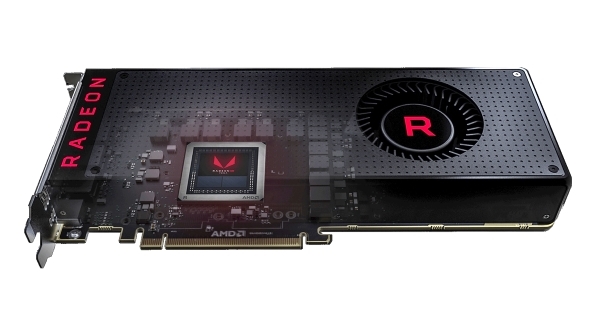 The fancy new AMD Vega graphics cards were officially unveiled at a tech day surrounding SIGGRAPH in LA. Despite the fanfare, I’ve got a feeling this is going to be the company’s last hurrah for the big, monolithic GPU design… because the AMD Navi architecture promises to be something entirely different. Read more: best graphics cards. 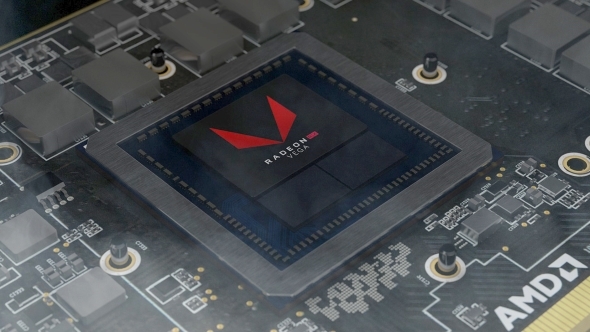 With the launch of the RX Vega consumer GPUs creeping ever closer, AMD have been looking to manage the somewhat over-enthusiastic expectations that have dogged their first high-end graphics card release in years. However, back around the launch of the Polaris architecture last year, at a dinner with AMD’s Richard Huddy, he told me it was actually the AMD Navi architecture that was going to be genuinely exciting. Stupidly, I’d thought he actually meant the upcoming Vega architecture, but, looking back on it now, I was the one drinking, not him… Maybe those Vega expectations were being subtly managed even back then. When AMD did start talking about the Vega architecture it was about it’s high-performance gaming chops. We assumed then they were targeting the very top of the GPU tech tree. That meant pointing their silicon guns directly at Nvidia’s Pascal architecture and the GTX 1080 Ti, which is the most powerful consumer GPU around right now. But to expect a design team – which hasn’t released a genuinely competitive high-end graphics card for a good few years – to top the performance charts with a brand new architecture was maybe a little ambitious. AMD’s best GPU efforts now look like they’re only really going to be able to perform at around the same level as, what is effectively now, Nvidia’s second-tier graphics card. A second-tier graphics card that was released some 14 months back. So, how do AMD make the subsequent Navi GPU architecture the big graphical game-changer they say it’s going to be? 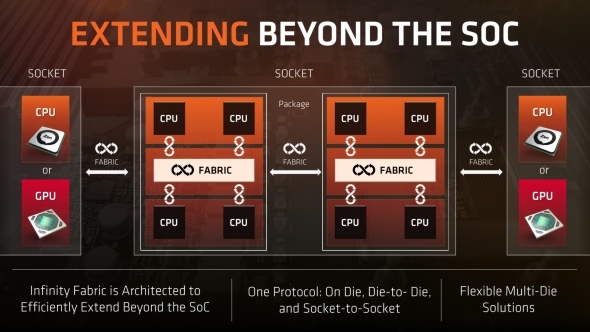 The answer potentially lies in the successes AMD have had on the CPU side of the business, and with the gloriously titled Infinity Fabric interconnect. This connection is what joins the two quad-core modules of the Ryzen CPUs together and allows them to ostensibly act as a single eight-core chip. They’re already using the Infinity Fabric to some extent inside the Vega GPU architecture, but it’s the potential for using it to connect multiple slices of graphics silicon inside one GPU package that could be what makes the Navi architecture such a big deal. AMD’s graphics guru, Raja Koduri, has already gone on record saying that it forms the basis of all their future integrated circuits. 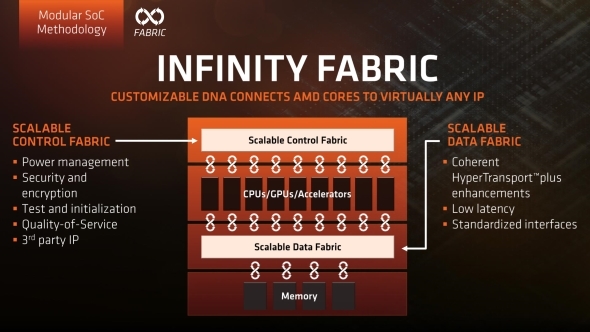 In short, if you want to jam a whole bunch of discrete GPU cores into a single package then AMD’s Infinity Fabric is the perfect interconnect for such a job. If the AMD Navi architecture really is going to be a game-changer then this could be the perfect way for them to achieve that feat. Going beyond the 7nm mark then is going to be even harder. 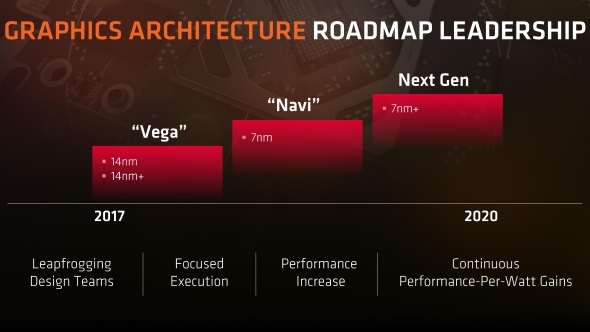 If we end up in a situation where AMD is hamstrung by another stutter in the shift to ever smaller production lithographies, as happened with the move from 28nm to 14nm, the monolithic GPU design would be an albatross around their necks again. But using a multi-chip design, which uses the Infinity Fabric to connect more lower-spec GPU silicon together in one package, could deliver the generational performance uplift they’d be looking for with Navi and beyond. And if they can make such a multi-GPU design practically invisible to the operating system, as seems to be more-or-less the case with their ‘glued-together’ Ryzen and Threadripper processors, then that could take care of the traditional multi-GPU problems CrossFire and SLI have endured. On the CPU side, the Infinity Fabric interconnect is capable of delivering near perfect scaling. If it can do the same with GPU silicon then the potential for the AMD Navi architecture is clear. If multiple graphics chips are able to work together in the same manner, Nvidia really ought to be worried, and not just in the gaming world either. Such an efficiently scaling GPU architecture would do wonders in the professional / artifical intelligence spaces too. AMD have also almost entirely backed off from the prospect of using CrossFire with their latest Vega GPUs, which would seem to feed into this future strategy too. The new cards are CrossFire-capable, and Asus are rumoured to be pulling some more Ares shenanigans with a bespoke multi-GPU card, but AMD have barely mentioned a single word about it themselves during any of their public briefings. That’s a marked change to their Polaris patter, where CrossFire was touted as the method for bridging the performance delta between them and Nvidia. It was only when pressed during a roundtable discussion, report GamersNexus, that AMD said, technically speaking, the cards would support CrossFire, but that the industry was largely moving away from multi-GPU configurations. 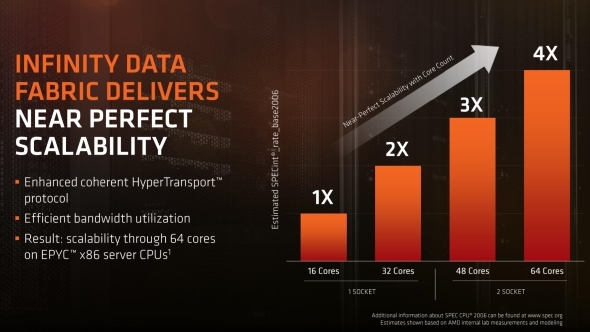 To me, this all points to a future where AMD are turning their backs on the traditional monolithic GPU design, instead utilising their impressively lithe Infinity Fabric interconnect to make a swarm of little GPU cores work together for the greater good. And that could make the next generation of AMD graphics chips entirely different beasts compared to their Nvidia rivals, and could well put them a long way ahead. So, what do you think? Am I living in a fantasy world or is AMD’s next generation of graphics processors going to be some sort of Epyc, multi-GPU, monster chip going to Infinity and beyond?